It will be a crack for the record books this Saturday, February 27th, at Whole Foods throughout the country. At 3:00pm Eastern Standard Time, over 300 cheesemongers will simultaneously crack into 85lbs wheels of Parmigiano Reggiano in an attempt to break their 2008 Guinness world record. Spectators will be treated with cheese samples, cooking demonstrations, wine pairing suggestions, and even some wine tasting (where allowed). So, what’s so special about this so-called “King of Cheese”? First is the exclusivity of the naming rights. 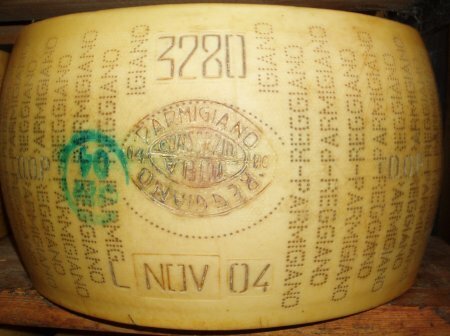 Only cheese produced in the regions of Parma, Reggio Emilia, Modena, Bologna, and Mantova can be called Parmigiano Reggiano. Second is the distinct taste. Sharp and nutty with undertones of fruit and a slightly gritty or crystal texture, this cheese is perfect for cooking and table service. The Italian treasure is made from raw cow’s milk from grass and hay fed cattle, giving it a fresh umami (savory) flavor. The average Parmigiano-Reggiano wheel is about 7.1–9.4 in high, 16–18 inches in diameter, and weighs 84 lbs. Third is the various uses of the cheese which include being grated with a grater over pasta, stirred into soup and risotto, and eaten in chunks with balsamic vinegar. It is also a key ingredient in alfredo sauce and pesto. Head out to your local Whole Foods this weekend and grab a taste of this amazing cheese and be sure to bring your cameras to capture this Guinness World Record-breaking event.